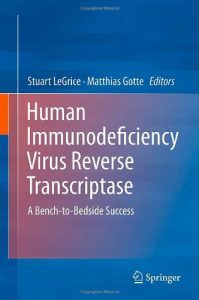 The Reverse Transcriptase (RT) of Human Immunodeficiency Virus Type 1 (HIV-1) arguably ranks amongst one of the most extensively studied retroviral enzymes. Heterologous expression and purification of HIV-1 RT in the early eighties, approval of the first nucleoside analogue RT inhibitor (NRTI) in 1987, discovery of resistance to RT inhibitors, approval of the first non-nucleoside analogue RT inhibitor (NNRTI) in 1996 and the various crystal structures of RT with and without bound substrate(s) and/or inhibitors represent only a few of the important milestones that describe the a bench-to-bedside success in the continuing effort to combat HIV-1 infection and its consequences. Nucleoside and nonnucleoside RT inhibitors remain important components in frequently used drug regimens to treat the infection. RT inhibitors also play important roles in recently validated strategies to prevent transmission of the virus. The relevance of HIV-1 RT as a drug target has simultaneously triggered interest in basic research studies aimed at providing a more detailed understanding of interactions between proteins, nucleic acids, and small molecule ligands in general terms. In light of the ever-growing knowledge on structure and function of HIV-1 RT, this enzyme serves as a valuable “model system” in efforts to develop novel experimental tools and to explain biochemical processes. This monograph is designed to provide an overview of important aspects in past and current HIV-1 RT research, with focus on mechanistic aspects and translation of knowledge into drug discovery and development. The first section includes chapters with emphasis placed on the coordination of the RT-associated DNA polymerase and ribonuclease H (RNase H) activities. The second covers mechanisms of action and future perspectives associated with NRTIs and NNRTIs, while the third section includes chapters focusing on novel strategies to target the RT enzyme. 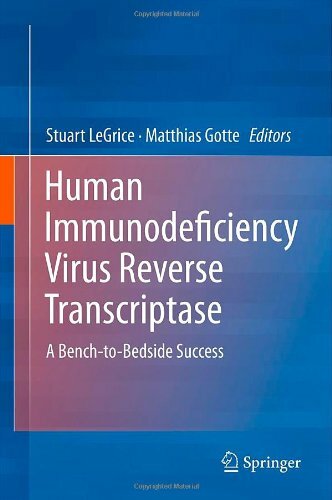 Chapters of the final part are intended to discuss mechanisms involved in HIV variability and the development of drug resistance. We hope that these contributions will stimulate interest, and encourage research aimed at the development of novel RT inhibitors. The lack of bona fide RNase H inhibitors with potent antiviral activity provides an example for challenges and opportunities in the field.